The Irish Hot Air Ballooning championship teams up with ViewRanger to offer GPS navigation, tracking and OSI mapping on mobile. The 43rd Irish Meet has partnered with ViewRanger to support the hot air ballooning teams taking part in this year’s championship. ViewRanger, the Outdoors GPS app, will be providing the teams with digital Ordnance Survey Ireland topographic maps covering the event area. 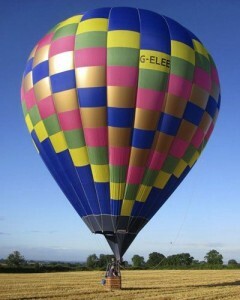 The Irish Ballooning Association is hosting the 2013 event, taking place for the first time in Drumshanbo, Co. Leitrim. 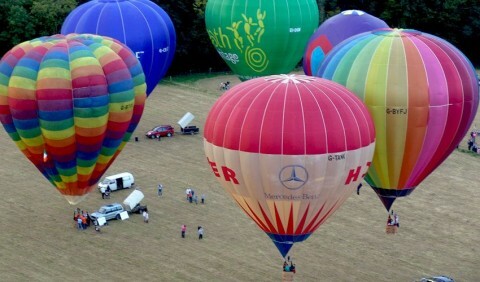 The Irish Hot Air Ballooning Championship is usually referred to as 'The Irish Meet'. This year it runs 22nd - 27th September. It is the longest running National ballooning event in the world. The first event was held in 1971 at New Castle House in Ballymahon, Co Longford and was attended by a handful of balloons. The event now attracts over 40 balloons. Using ViewRanger on their smartphones and tablets, hot air ballooning teams will be able to navigate and track their flights over detailed Ordnance Survey maps of Ireland. Using data overlays within the ViewRanger app, the teams will be able to see no-fly areas, mast locations, and other information not shown on the OSI map itself. The ViewRanger app will also benefit the ground support crews, as many ballooning teams will be using the ViewRanger BuddyBeacon location-sharing capability to broadcast the live location of the balloon to their ground support crew. In the past this BuddyBeacon feature has proved invaluable for air sports events and expeditions including the Incredible Solar Electric Flight undertaken by paramotor company Parajet. The ViewRanger app runs on a massive range of smartphones and devices that use the Apple iOS (iPhone/iPad), Android, BlackBerry 10, or Symbian OS and works virtually anywhere in the world using open source web based mapping, which can be cached for off-line use. Additionally, it can upgraded to run premium topographic map data like Ordnance Survey maps and also has support across another 21 countries. A testament to the app's accuracy and reliability is the fact that it is today used by over 100 search and rescue teams across Europe, Canada and in the USA.